The Waterblogger: Noxious Weeds: Where Are They Going To Show Up NEXT?? Noxious Weeds: Where Are They Going To Show Up NEXT?? This column we are pleased to welcome our first guest blogger: Soil scientist Tom Keck of Bozeman. Keck received his PhD in Soil Science from Montana State University in 1998 and was the lead field scientist for several years collecting the data for Silver Bow County's soil survey. He currently works in Bozeman as a Soil Scientist for his own company, Northern Rockies Soil and Water. 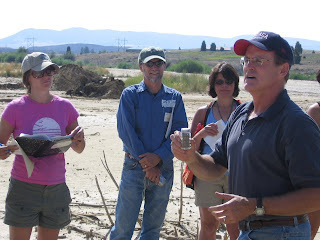 Tom is also a valuable cooperating scientist with CFWEP, helping improve place-based science education in the Clark Fork basin as a summer teacher training instructor (see photo). If you're reading this and are a scientist living or doing research in the Clark Fork and would like to contribute a guest blog, drop me a line at mvincent@mtech.edu . We'd love for you to help us spread science through the valley! In the “War on Weeds”, spotted knapweed and leafy spurge stand out as the major weed control challenges in Silver Bow County. Each weed has infested thousands of acres in the county and there is potential for them to infest even greater acreages. Weed infestation reduces property values, increases soil erosion, reduces areas’ ability to support wildlife or domestic livestock and presents tremendous weed control costs. Countywide, the government currently spends nearly $400,000 annually on weed control efforts; this does NOT include additional costs that individual landowners pay to control weeds on their own. Noxious weeds are an expensive issue to say the least! Weed species often appear to be everywhere in infested areas. Spotted knapweed in the Butte area provides a good example. Once you learn to identify this species (pictured below), it seems to be growing everywhere you look. On closer inspection, however, you can find areas in and around Butte where spotted knapweed is not doing so well. There are many sites where it is completely missing, while in other areas, native plants are at least holding their own against the noxious invader. An ongoing study funded by the Mile High Conservation District through the Conservation Districts Grant Program has been using field data from numerous locations in Silver Bow County to look at patterns in the distributions of spotted knapweed and leafy spurge relative to landscape, plant community and soil properties. The study looks at habitat preferences in existing infestations to gain a better understanding of how these weed species would be expected to behave on sites that have not yet been infested. The immediate goal is to find differences among habitats in the potential for future infestation by spotted knapweed or leafy spurge. This research could ultimately lead to development of site specific strategies for weed management. In such an approach, the combination of weed control methods used for a species such as leafy spurge on a dry, rocky hillside would likely be quite different from those methods used to control spurge along a moist drainage bottom. Identifying habitat differences is a first step. While some of the results found in the current study were expected, others have been quite interesting. Both spotted knapweed and leafy spurge originated in grasslands of Eurasia. Therefore, it comes as no surprise that the highest infestation levels found in Silver Bow County were in grassland areas. Neither species is very competitive on forested or riparian (near stream) sites in our area. Woodland areas, with open Douglas-fir stands, are intermediate in terms of infestation potential. Neither weed species likes to get their feet (roots) wet for long. This explains their relative absence in consistently wet soils along streams and in other wetlands areas. Elevation, slope steepness and slope direction (aspect) have a strong influence on the occurrence of both spotted knapweed and leafy spurge in Silver Bow County. 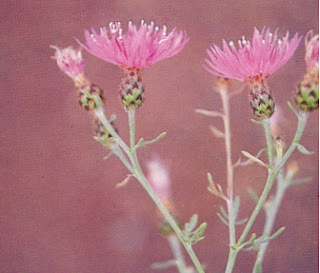 The highest infestation levels for spotted knapweed occur below 5,800 feet in elevation while moderate infestations levels were found up to 6,600 feet. For leafy spurge, the highest infestation levels are restricted to elevations below 5,600 feet. South facing slopes (hot and dry) were the most favorable for spotted knapweed while leafy spurge was most prevalent on level to gently sloping areas (deeper soils; deposition areas). Both species appear to be least competitive on north facing slopes. Overall, the worst leafy spurge infestations were found on very deep well drained (normally dry) soils along drainage corridors. This was especially true where basin wild rye was the primary grass species present. The second most common occurrence was on droughty, shallow soils on volcanic hills such as along portions of I-90 in northwestern Silver Bow County. While leafy spurge fairs poorly on soils formed from decomposed granite, spotted knapweed does especially well on the very deep, coarse textured granite soils common in the Summit Valley. Those are just a few of many results. At the conclusion of this work, maps will be produced through the Butte-Silver Bow GIS Department showing infestation potential throughout the county. This information will be used to target weed control activities and to support future research on site specific weed control strategies. As a landowner or tenant, you should be aware of noxious weeds growing on your property. Know how to identify weeds, at least spotted knapweed (below left) and leafy spurge (below right). Scout your property regularly and note their presence if you find them. Pay special attention to where they are growing and begin weed control or encourage the landowner to begin weed control as soon as possible. Remember, early detection and control is by far the most cost effective means to fight noxious weeds. The sooner you get them, the less likely they will be to spread out of control. There is a reason they call them invasive: Weeds infestations will continue to grow if left unchecked and the cost of control grows with them the longer you wait to take action. For more information, please contact the Butte-Silver Bow Weed Control Office at 497-6460 or weeds@bsb.mt.gov.